The New Normal slipped from being NBC’s third-highest rated scripted series to fourth. This wasn’t directly related to the freshman sitcom’s latest ratings however. The series hasn’t even been on the air for a couple weeks, thanks to Hurricane Sandy coverage and election night. The Office actually moved up a spot, thanks to having a special Thursday edition of The Voice as a lead-in. That was a one-time event so it’s reasonable to expect that The Office’s numbers will go back down but it’s also the sitcom’s final season so you never know. It may be an interesting little race to see the two sitcoms duke it out for third place. What do you think? 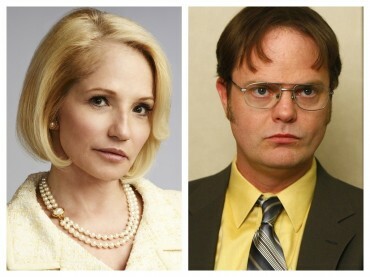 Which do you think will end up performing better — the first season of The New Normal or the final season of The Office? These charts incorporate the daily final NBC show ratings (reported by Nielsen) and are sorted by the 18-49 demographic. Network advertisers typically prize those viewers most and so will pay more to reach them. There’s lots of information that the networks take into consideration when cancelling or renewing a TV series but the ratings are the biggest factor. The higher the ratings, the better chance that the show will be renewed. And yes, they take it into account when a show airs on a Friday or Saturday night. For the status of your favorite NBC shows, check out this page. NBC Ratings Race: Revolution Hits Series Low; In Danger? NBC Ratings Race: Is Revolution Still Doing Well? the new normal. no other show can match it . every episode has a blend of comedy and drama. andrew rannells and ellen barkin are great! give it all the time and airplay it can get. nbc needs to stick with it! NBC is still hurting for viewers. “The New Normal” needs to stay on. It’s great for the climate of our country currently, and different than most shows on now. NBC needs to hold tight on this one.